NextCoup is one more advertisement-supported program we can link to the family of software specifically known for name randomization. Applications from this group have original names; however, they may differ from one system to the next, making it more difficult to delete them. Even automatic malware removal software may be tricked into overlooking the suspicious software if it changes names. We can help you remove NextCoup, even if it is installed as NExtCoupa, NaeXTCoup, NextCOuiP or NextCioup. The browser extension NextCoup is suspicious all around. This program not only can conceal itself from removal; it also can slither into the operating system without your permission. Since the download button on nextcoup.info is inactive, and computer users would never install the application themselves, the developers of NextCoup often use software bundling for its distribution. If you want to avoid the illicit infiltration of the plugin you will need delete, you should not install unfamiliar software, especially if it is presented by DomaIQ installers. Note that these usually hide behind fake Java and Flash updates. Whether you are dealing with NextCoup, Extra Savings, ClickForSale, TicTacCoupon, or other applications alike, it is most likely that you will face the same course of actions. As soon as the program enters the PC, it utilizes web cookies to discover your preferences and interests. After this, the collected information can be shared with parties affiliated to adware creators. These parties may use the data to present authentic or completely misleading and bogus offers. It is up to you to figure out which offers are fictitious; however, since this task is extremely complicated, we suggest that you delete NextCoup altogether. If you remove NextCoup now, the intrusive tracking cookies will be deleted, and the disturbing pop-up and banner offers will seize to flood your browsers. Unfortunately, in some cases suspicious offers may continue to pop up. If this is the case, it is possible that additional adware is already running on your operating system. Since NextCoup enters the PC illegally, it might do that bundled with other malware, and getting it removed might be even more important for your virtual security. 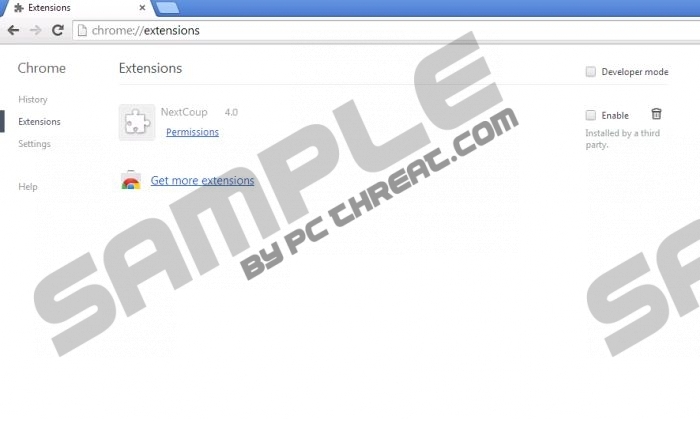 You can delete NextCoup and other potentially bundled threats using automatic malware removal software. SpyHunter is a legitimate security tool which can inspect the operating system, locate all existing threats and then delete them in the most efficient manner. Click the download button and install this tool onto your vulnerable system. Use this software even if you have chosen the manual NextCoup removal. In the appeared list double-click Add or Remove Programs. Open the Start menu (click Windows icon) and select Control Panel. In the appeared menu click Uninstall a program. In the appeared menu select Control Panel and then Uninstall a program. Finally right-click and Uninstall the program you want deleted. Quick & tested solution for NextCoup removal. Yes, its very anoying and hard to remove. You see this is what happens when you let someone whom is computer illiterate use your computer. >_>. Working on removing this annoyance. Thanks for the info.